A long over due weekend In Joshua Tree. I made the trip with the Fisher Brothers; John and Jeff. John is my long time climbing partner. Jeff has been climbing for a couple of years and coming on strong. We left town Friday night and I was only 1/2 hour late, despite the boss calling a 4:30 meeting!!. This was an improvement over my last dash for the outdoors. We drove in John's rig and followed the traffic East bound. The first major traffic was at the junction of the I-10 and the 57. For entertainment we cranked out the laptop and looked at saved pictures from the web. "Hey check out this full suspension mountain bike....look at this sunset.... and check out the curves on this rig....". "Looks pretty hot" To ease the stress of the traffic we loosened up with a little Hacky Sack a the In-and-Out Burger. 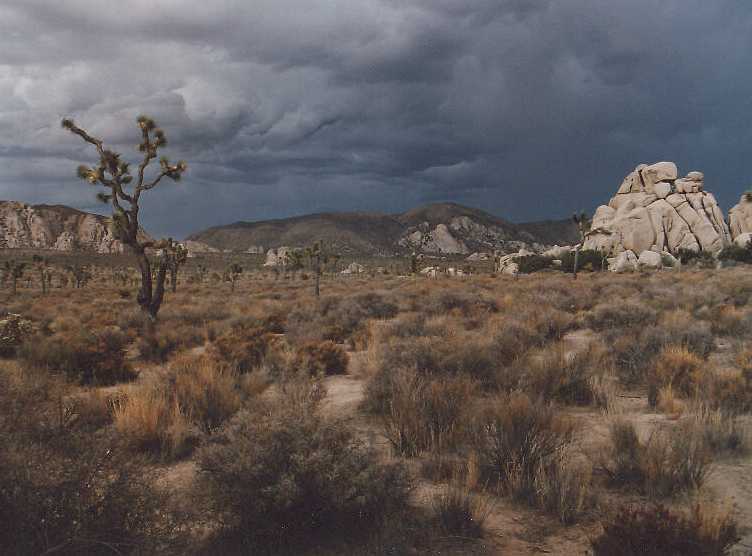 We arrived at a cold Joshua Tree at about 11:00 and surpassingly found a camp site at Ryan Campground. It was so good to get out of town. Cold. We got motivated after the traditional Hacky sack warm up. Off to the Geology Tour road. 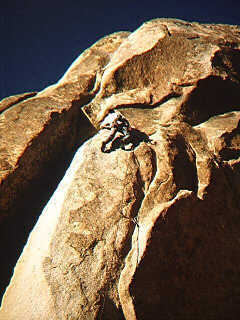 This section of the Park offers all kinds of climbing on small granite domes and pinnacles. 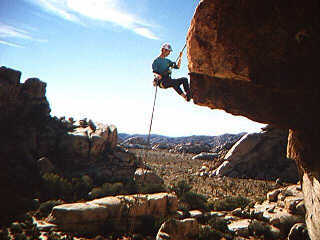 There are many outcroppings that offer challenges to satisfy any climbers. We started at Reef Rock. The Crag looked so much bigger in the guidebook. Jeff led this 5.9 crack and face thing but it was short. Them we top roped a 10d. That was fun but we wanted more. Off the Virgin Isles. John and I had climbed there many times before. One of our favorites "Light Saber" was on the list. But not before we tried this 10d crack climb "Cedric's Fish Market". It was thrash and dangle. John started it out and fired in 3 pieces. Then I went up and could only put in one more. We all took turns climbing this. Jeff finally pulled past my high point and finished the route. He was climbing well..
Then on to Light Saber. Great climb as always. 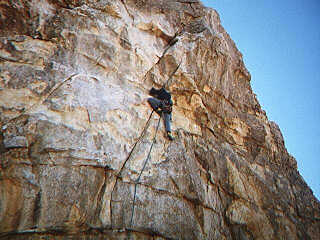 5.10a crack to a funky crack and stemming move, The weather was superb. We basked in the desert sun. One more challenge on a new face climb, yet unnamed to the right of the Light Saber. We all gave it a go and Jeff pulled out the crucial lead again. He was crankin...We walked out in Twilight and relaxed at the car over the leftovers from my OctoberFest party. Off to camp for Salmon Steaks and a warm fire. Where to climb. It took some time to figure out where we were to go. We decided on the Echo area. 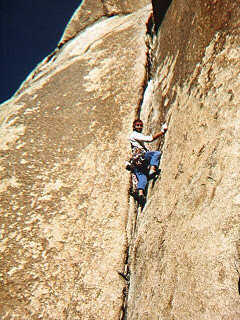 First climb was Pope's Crack". 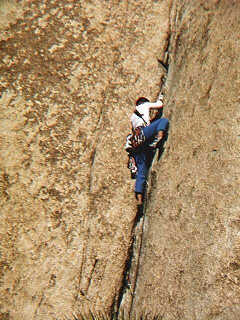 It has been some time since I lead a climb but the last I did this climb I had a great time. I cranked the route. It felt so good being back on lead. I need to do this more often. But other commitments keep me from real climbing. I savored the moment and took in the view from the belay ledge. Killer view. Joshua trees abound and snow covered San Jacinto is looming in the background. 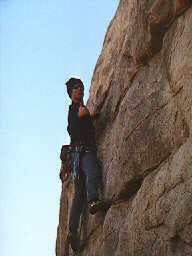 I belay the others up and then go on to the next climb. John leads Touch and Go (5.9) and fires the thing. A minor slip above his first piece but John hangs in there with his overpowering strength. A rappel from the top and now on to the next climb. It's time for a roof climb. We scope out Crime of the Century but at 11a find it too severe especially since our bodies are beaten from yesterday. So we go to the roof across the canyon and Jeff leads the 5.9 roof, slight hesitation at the lip of the roof and then fires over the top in fine style. We all give it a go and finish with a fun overhanging rappel. On to the next climb. Now we wanted to do "Heart and Soul" but someone was already on it. So we go over to "Chalk up Another One" (5.10). Jeff is feeling studly and opts for the lead. He fires the lead. Way solid. John follows and I take the last run on the rope. Pretty dicey climb but loved every minute of it. We finish the day with the Hacky Sack cool down over some brewskies. It was a fine weekend. The operative question is when will I return. Hopefully it will not be as long as this last sabbatical from the climbing scene. Time: 7:34PM and we are in Calimesa. I write this as we are motoring on Interstate 10. How else should I spent this boring drive home. Another 1 1/2 hours back to the valley. We are now in San Bernardino. Traffic is moving at 70. We're jamming. The B52's are playing and Jeff is doing business on the Cell phone. The 3 hour drive back from JT is seldom filled with excitement. JT is a great place and brings many fond memories of good climbs, great friends and endless challenges. More JT stories to come. On a trip prior to the one above I visited JT with my girlfriend now wife. We spent 5 days in the desert and we still got married. Anyway we were on a hike and the wind picked up telegraphing an oncoming storm. The picture below is one of my favorites I have taken in JT. The sky opened up and drenched us within 5 minutes of taking this picture. Another fine day in JT.